I didn't like that I didn't get a room where I asked for. I did not like that the guest bathroom didn't have any curtains, so when some one shows the water just splashes all over the bathroom floor. & If some one needs to use the restroom they have to go through one of the rooms, no privacy in that concepts. I wanted a room in building 3 8th floor & I was willing to wait for it, I even reserved the penthouse months in advance. I was brushed off because they had this time share event going on. If I wouldn't have paid by the time I found this out I would have reconsidered my stay. The resort is very pretty and the location is a close to the strip but far enough away from the hustle and bustle which is great for families looking for a break. However, while we were staying, we did have some noise issues. And, there was a lot of miscommunication about when things were open (pool slides, restaurant, etc) from the staff. They all seemed much more concerned with selling time shares than helping the guests that were paying to stay which was a bummer. There did seem to be a ton of time share presentations going on so I don't know if that is always the case but it definitely seemed to be a priority over actual customer service during our stay. I can't say that it would detract me from staying here again but it definitely wasn't a good look. We loved the pool and slides. water was warm on a cloudy day. One room sweet was great. Renevation was going on, so registration was a little crazy. First day got held hostage by the resort trying to sell me a time share. I didn't even use their "presents" it made me so mad 5 hours right off the plane wasted. I probably would have bought one if they weren't so pushy because the property and everything else was so beautiful. Just seemed like they had something to hide. Other than losing one day of vacation it was great. I loved the rooms. It felt like i was staying in a condo. The grounds were beautiful. They are still renovating so really no lobby. My stay was to brief and the weather was bad to enjoy the stay completely. But definitely worth going back. Everything was good even the heating was not working in the befinning. I like the hotel theme and rooms conditions. The distance from the outlets is very good. Cancun Resort by Diamond Resorts places you within 3 miles (5 km) of popular attractions like Town Square Las Vegas and Welcome to Fabulous Las Vegas Sign. This 440-room, 3-star condo resort has 2 outdoor pools along with a full-service spa and a restaurant. Explore the condominium resort and meet new friends over drinks at the bar/lounge, or enjoy a bite to eat at the onsite restaurant. Order from room service to satisfy your hunger without leaving your room. Cooked-to-order breakfast is offered for a fee each morning from 8 AM to 11 AM. Each condo is air-conditioned and features a kitchen and a balcony, and there's space to spread out with a living room and a dining area. A flat-screen TV comes with cable channels and a DVD player, and guests can stay connected with free WiFi. The bathroom offers hair dryers and free toiletries. Other standard amenities include a sofa bed, a coffee maker, and a ceiling fan. Housekeeping is available on request. 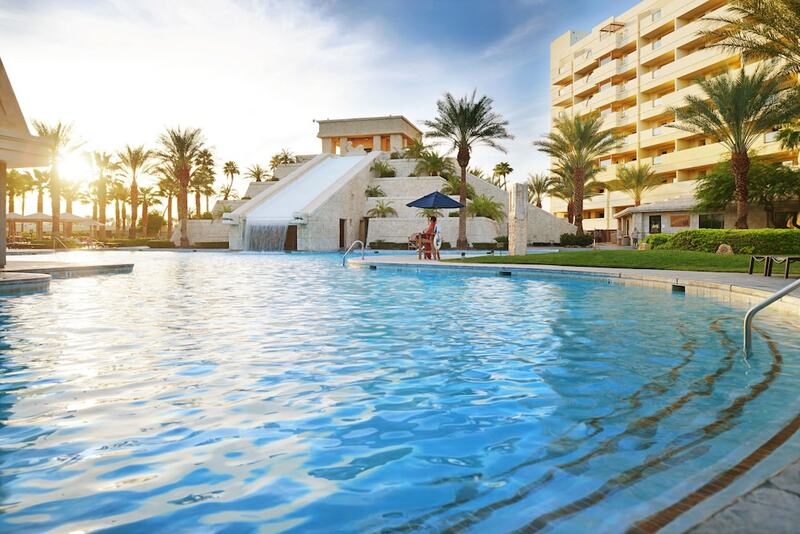 Guests of Cancun Resort by Diamond Resorts have access to a full-service spa, 2 outdoor pools, and a fitness center. If you plan to drive, free parking is available. The 24-hour front desk has staff standing by to help with concierge services, and answer any questions about the accommodations. Other amenities at this spa condominium resort include WiFi in public areas, a business center, and a seasonal outdoor pool. Thanks for your feedback! We hope to achieve a 5-star rating on your next stay! Thanks for your feedback! Sorry about the inconvenience! We hope to achieve a 5-star rating on your next stay! Thanks for your feedback! Hope to see you again! Your feedback is cherished and we will be delighted to welcome you back on your future voyages.We recognize how these events could shift your view; however, we do advise on amenity and restaurant hours on our website and affiliate sites to prevent any dissatisfaction. Cancun Resort aims to present nothing less than extraordinary service and apologize if this was not delivered. We hope this experience does not deter you from experiencing priceless vacations with us in the near future. Diamond Resorts prides itself on presenting a memorable vacation experience and we look forward to your next visit. Thank you for providing your rating. We look forward to providing you an exceptional vacation in the near future. ---- Cancun Resort appreciates you taking the time to provide your feedback. As we are a vacation ownership property, we do offer all our guests the opportunity to obtain more information on becoming Diamond Resorts International® owners. It is never our intent to provide a negative experience and we apologize if you felt otherwise. Our friendly front desk is accessible 24 hours and will promptly assist with any concerns and/or requests brought to their attention. Diamond Resorts prides itself on presenting a memorable vacation experience and we look forward to your next visit. The condo resort has 2 outdoor swimming pools and a seasonal outdoor pool. A waterslide and a fitness center are other recreation options. Reservations need to be made in advance for massage services and spa treatments. Contact the condo resort at the phone number listed on your booking confirmation.